You see as parents, hubby and I have been having a problem with the babes pants riding up when we wear him in the baby hawk, while he is in the stroller and the car seat. Now that the weather is much colder this was becoming a problem that we needed to fix as we didn't want our little guys legs exposed to the chilly weather. One option was a snow suite but for Oct that might be a little too much. The next idea was a pair of long johns but lets be truthful we would go crazy when it came to diaper changing. After spending an afternoon with a friend I had the problem solved baby leg warmers or BABY JOHNS. That is where my adventure in Baby Johns started. I really love wearing these on the little man. 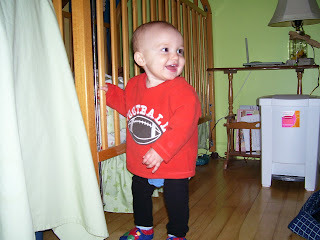 I find that they are keeping his little legs warm when his pants ride up and they are not a hassle to us because they do not need to be removed during a diaper change. They are even great for wearing around the house. He is enjoying them as they have help to keep his knees from getting to banged up on the hard wood floor while he is crawling around. Besides looking like an exercise instructor from the 80's (minus the sweat band) these have been serving the purpose. Now that he is getting a bit older these will come in perfect for potty training because he can just run around the house in them; with no pants to get on and off hopefully we will make out OK. Also they are not just for the winter months although they do help keep their sensitive skin protected but in the spring and summer months they can be wore with a little skirt (no having to take the tights off for a diaper change) or shorts during the cooler summer days and nights. Last weeks menu went very well. It seems that Monday's have become my soup and biscuit day. This past week when going to make my classic biscuit recipe I noticed just below the recipe I had written another recipe for Jiffy Cheese Biscuits. So I decide to make these instead and now they are a new family favorite. 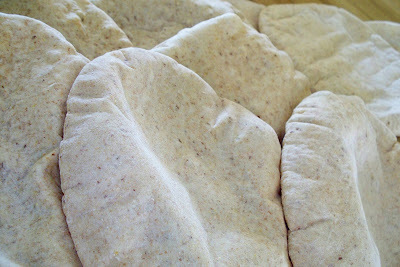 Combine flour, baking powder, sugar and salt. Cut in margarine (I like to use a fork since I don't have a pastry cutter). Add Cheese and water. Mix well and drop by spoonful on greased sheet. Bake at 400 for 20 minutes. Monday: Birthday celebration for our friend Weiwei. Last year I made this delicious crown roast; so now I have to try to compete with that. Wednesday: Eat on the run. Sandwiches; grilled cheese? ~ Seems now that winter is here we are back to baked beans on Saturday nights!! For more great meal ideas check out Laura's site. I am still around. I have just been taking a blogging break. I need some time to get my creative juices flowing. I will be back next week with recipes. Also with Christmas just around the corner (I know many of you don't want to think about that) I have been working on ideas for cards, goodies and gifts. Eating breakfast every day can help improve concentration, reduce hunger and maintain a healthy weight. Look for fast and easy choices such as whole grain breads and muffins, cereal with milk, fruit and fruit juice, yogurt and yogurt shakes, cheese, and eggs, or be creative with last night's leftovers. Breakfast is proven to be the most important meal of the day. Breakfast is so important because at night when we are sleeping our body goes into a hibernation state. Everything that we have eaten gets stored away; when we wake up we need to let our body know that the fast can be broken. That is why we call it breakfast. Our body needs fuel to get us through the day. When we don't eat breakfast our body slows down and can't function properly.Breakfast gets our metabolism going and therefore has been proven to help with weight management! For other great breakfast ideas head on over to HERE to find some creative breakfast treats. You may feel like its a lot of food but remember its this meal that is going to help you get through the rest of your day. 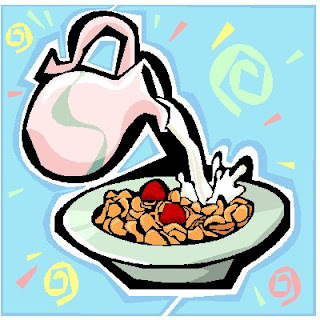 Studies show that people who eat breakfast are less likely to over eat at night! Plus everything you put in your month in the morning is going to be burnt off as energy throughout the day! Just when you think that you can't eat any more turkey (well until Christmas dinner that is) there is still a little bit left over for this weeks menu! After enjoying turkey every night last week we will finish up the last bit in turkey soup this week. Here was our turkey menu from last week. Sorry there isn't any pictures. I will get back to getting some once we get our old camera up and running. Tuesday: Black bean and pumpkin chili. This recipe was delicious and had turkey in it. The recipe was from Taste of Home. 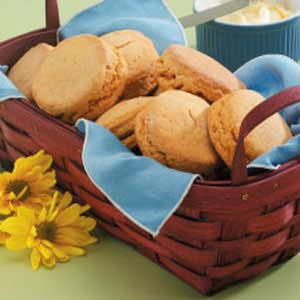 I baked up some of these delicious sweet potato biscuits to accompany our chili. I didn't know how they were going to turn out because the dough was sticky but they turned out great. Wednesday: Cran-Orange Turkey bagels. This was a great twist on the regular turkey sandwiches. The difference in these bagels is that you mix cranberry jelly with mandarin oranges. Then you spread that on a bagel that has cream cheese on the bottom. Thursday: BBQ turkey pizza. I made my homemade pizza dough. Then topped it with BBQ sauce, red peppers, onions, a little bacon, turkey and cheese. So now for this weeks menu. Saturday: Maybe hubby will cook and if not baked beans it is!!! What a deliciously beautiful food that most people only enjoy around thanksgiving and of course the occasional pumpkin pie at Christmas. But pumpkins are such a power packed ingredient- low in calories, contain folic acid, antioxidants and carotene- that goes great in just about anything. Believe me when I say anything I mean anything; right babe!!! During harvest season pumpkins can be purchased for next to nothing, especially for a cooking pumpkin. "Whats a cooking pumpkin you ask??" Well they are the smaller pumpkins that you usually see laying around the grocery store. Some times they are even labeled pie pumpkins. Its best to cook with these because there isn't a large amount of stringing pumpkin goop and there's not an abundance of seeds. These two pumpkins where picked up at a local apple orchard during a sale they were having buy one pumpkin get one free. So I paid a whole $2.00 for these two guys. After I washed them I used my strongest sharpest knife to cut them in half. and using a spoon I scooped out all the seeds and goop from the center. If you would like to cook the seeds you can place them into a collendar and clean the goop off this way. Placed the pumpkins face down on a cookie sheet that has some water in it. Then stick them in the oven and bake on a low temperature (180-200) for 2-3 hours or until you can easily put a knife in it. Pumpkin seeds are highly nutritious and a good source of essential fatty acids (omega 3), unsaturated fat, protein, magnesium, phosphorus, zinc and potassium. They can be cooked at the same time as the pumpkins. I usually coat them in oil and salt. 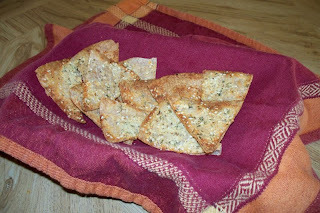 You can add any kind of flavor (herbs, spices or even pop- corn seasoning) that you would enjoy. Another yummy treat is to cook them with a little margarine, brown sugar and cinnamon. Now what do you do when the pumpkin is cooked?? OK so its just an old coffee can! But it sure does the trick. I simply just place the baggie inside the can making sure that the top of it is around the can and pour in my puree. This has made freezing much easier and a whole lot cleaner. Now back to the pumpkin. I froze the pumpkin in 2/3, 1/2, and 1 cup measurements. I labeled them for certain recipes like 2/3 for pumpkin waffles, 1/2 for pumpkin dip and 1 cup for cookies. Also I froze some pumpkin puree by 1 Tbsp in an ice cube tray; when frozen I will put them into a baggie and label pumpkin latte's. So you see it isn't that much trouble to puree your own pumpkins so that you can enjoy this delicious flavor year round. There are many recipes you can find that have pumpkin in them. Just recently we had black bean and pumpkin chili (it also had turkey in it) that was very delicious. If you are a pumpkin lover it does save big bucks pureeing it yourself. A can of pumpkin at the store (~2 cups in a can) is well over $3; I bought both of these pumpkins for less then that and you can get 5-6 cups from 1 pumpkin. Long time...no post. With Monday being a holiday (Thanksgiving) I'm having a hard time getting back into a routine. I have been trying many new recipes so be sure to check next week for all the wonderful things I have made with delicious harvest foods. 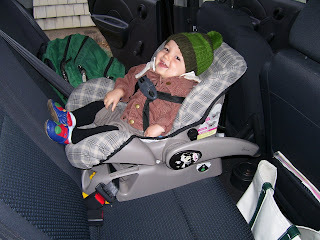 Here is a post that I have been meaning to tell all you baby readers about. They are mini meat balls. You see at around 7 or 8 months the babe started his independent stage where he just wants to eat by himself. You think this would be wonderful but its hard to think of finger foods for him to eat. One day well making meat balls I thought why not throw some together for the babe: its a meal in a ball. I didn't really have any recipe so I will just tell you what is in them. I mixed all together and formed into mini bite size balls. Bake at 350 for ~ 20 minutes. They don't need to cook long as they are very small. Once cooked I frozen them on a cookie sheet, when frozen simply pop into Ziploc baggie. At meal time put some on a plate and microwave for 30-40 seconds. The babe loved these! Hello readers. Before hubby, the babe and I take off to join our family for Thanksgiving I just wanted to leave you with some post that you may enjoy and may come in handy during this years celebrations. Now for kitchen stuff. Here are a few of my favorite recipes. Sweet potato pie is an easy and great alternative to old faithful pumpkin pie. These delicious cookies are soft, chewy and go great with any cup of tea. But if you are looking for a alternative to tea why not sit and enjoy a nice hot pumpkin latte. Enjoy Thanksgiving and don't forget to mediate on the wonderful things God has blessed us with!!! My question for this week was is it better to use Splenda instead of sugar? There are so many articles out there it would have taken me a very long time to boil it all down into a comprehensive answer; so instead I am sending you to Small bites nutrition. Its a blog that I love to read and the author is on the track to be a registered Dietitian doing his masters. He always has good articles and I just happened to remember one that he did on Splenda back in February. Its a well done article so jump on over to his answer on Splenda! Another week gone....wow I can't believe we are in October already. I love this time of year nothing bets the taste of fresh apples, squash, sweet potatoes and of course pumpkins!!! It seems even since I pureed up a sugar pumpkin all I want are pumpkin flavored foods. I have so many new pumpkin recipes to try. This past weekend I cooked up a batch of delicious pumpkin waffles, which were a big hit here and will be added to our family favorites. The recipe was found in the latest taste of home cook book. I am looking forward to the end of this week because its Thanksgiving for us folk here in Canada. 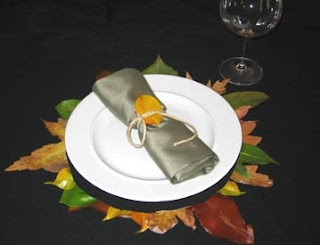 I love thanksgiving meal and usually stuff myself silly with turkey and all the fixings! We are heading home for the weekend and look forward to being with our family so it will be a short week and hopefully no leftovers to leave around for the weekend. Saturday, Sunday and Monday: THANKSGIVING!!! yummy turkey, stuffing, potatoes and gravy!!! I think that fall is becoming one of my favorite seasons. The colors are gorgeous and I just love seeing the neighbors door steps and front lawns filled with pumpkins, hay barrels, mums and of course gourds. Every thanksgiving my hubby's aunt and her daughters usually do the decorating for our family feast. They are so creative, so I can't take any credit for these candle holders, I was inspired by them. While out the other day at the apple orchard I couldn't pass up the opportunity to pick up some gourds (3 for $1) to decorate my house with. I tried to get gourds that would stand up on their own so they wouldn't tip over, something you probably don't want to happen with a candle holder. Next I washed them up and then traced out a line where the tea light would go. Then I cut around the circle and scooped a little bit out until the candle fit in. Then I sprayed them with sealer, let them dry and now they are placed inside and outside of my house. This was one high class camping trip. When it comes to the menu that is. 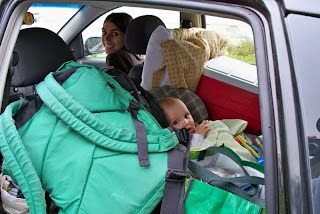 Now I should let you know that it wasn't just our tiny family of hubby, me and the babe that went camping. This was the annual family camping trip so at most meal times there was 8 adults, 4 children and 1 babe. During the supper meals we had other family members and friends stop by to visit so that bumped our total up to 20-30 each night. To prepare for camping I made some food to take with us. The chips were a bigger hit then I expected. I got the recipe from Company's Coming Mexican cook book. 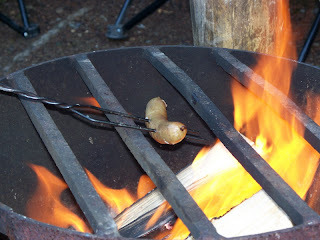 After spending our first night at the camp ground and the kids practiced their hot dog roasting skills they wanted to roast there breakfast sausages as well. 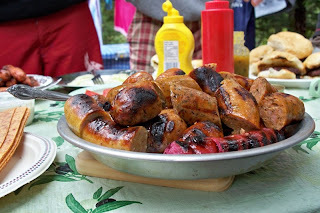 It took a lot longer to cook these things over the fire but it kept them occupied while the pancakes, home fries, bacon and other sausages were being prepared. 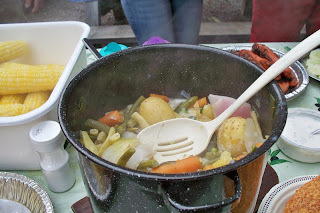 One of our favorite camping meals is Hodge podge. Its a mixture of lots of fresh vegetables from the garden smothered in butter and soaked in cream! This meal was accompanied by the most delicious sausages you have ever tasted (please note that I rarely eat sausage and don't recommended eating these in high quantity...hehehe). These wonderful pieces of meat came to use from the Market in Quebec City and were brought to us by hubby's brother and his wife. What makes them so delicious is that they are all different flavors; that is also why we cut them into small chucks like that so everyone can get to taste them. Some of the flavors here were curry, lamb and mint, the pink looking ones are blueberry, orange ginger...that's all the flavors I remember (Peterson family you can help me out if you remember the other flavors). And of course what would this meal be with on fresh corn on the cob! This cool Coleman BBQ/Grill things were great to have with us. The made wonderful burgers and nice golden brown pancakes. 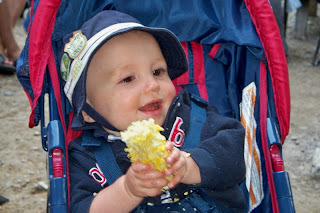 Other foods we enjoyed can not be shared because they were eaten once the kids were in bed...ok since they can't read yet and probably are interested in their aunts kitchen story's I will let you in on our camping secret. We had chocolate fondue. We milked down our Swiss chocolate in a pot then placed it in the founde pot. We sat around the pinic table enjoying many different fruits and of course marshmellows dipped in this delighful chocolatly goodness. Our last morning there my mother in law whipped up this special treat for us. She had brought some brie cheese. Sliced it in half and filled one with peach jam and the other with raspberry jam. Then they were wrapped in tin foil and place over the fire for a short minute or two to melt. 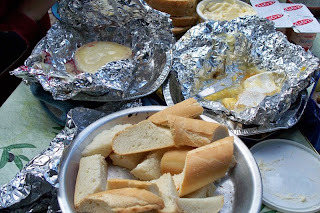 When they were done we enjoy french bread dipped in this delicious melting cheese! 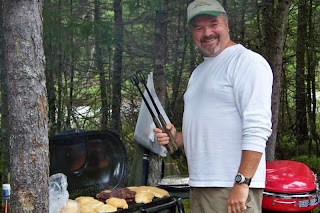 After this years camping trip I don't know what the menu will be like...I think we over did it this time. I think as the kids start getting a little bit older we might be going back to KD, beans and weiners!! Ok I am really exposing my self here by sharing with you some of my kitchen secrets. I am sure most of you have heard the phrase somewhere along the lines that we have become a "super size society". This is not only in terms of the amount of food we are consuming but also the way in which our waist lines are expanding. Because I am the main cook in our house I have decided to come up with a few ideas on how to pre portion our food into proper serving sizes (hubby you can stop reading here! heheh). I will have to do another post later on my magic 1/2 cup serving ladle! But for now I am going to talk about these pretty, and portioned, apple crisp. My friend Niki over at Organizing Connections gave me the idea when we were sharing ideas on how to freeze the 21 lbs of apples we had each picked. 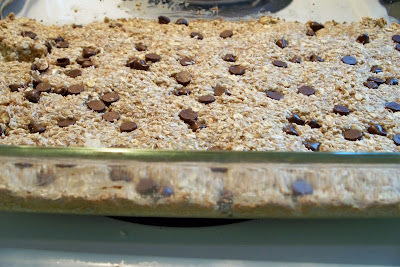 The recipe is simple to follow it is basically your ordinary apple crisp recipe. Then instead of baking it up in a large pan you simple layer (I used 500 ml mason jars) sliced apples, topping, sliced apples and end with a little more crumble on the top. I baked these on a cookie sheet in a 350 oven for about 30 minutes. When they were finished they were about 1/2 cup serving and to make the jar "look" fuller I added 1/2 cup of ice cream to the top. One thing to remember when serving them like this is that you need to let the glass cool so you, your guest and of course your kids won't get burnt. Also you don't want the ice cream melting too fast if its way too hot. ~ If you have enough freezer space these can be made a head of time and frozen. Just be careful when you are thawing them not to do it too quickly as they will crack.